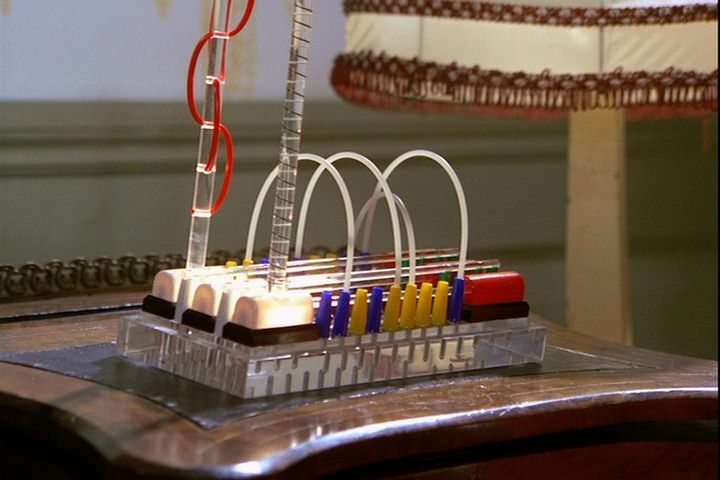 John Kenneth Muir's Reflections on Cult Movies and Classic TV: UFO: "A Question of Priorities"
"A Question of Priorities" -- an early episode of Gerry and Sylvia Anderson's UFO  -- is very much a case of the series' potential fully realized. 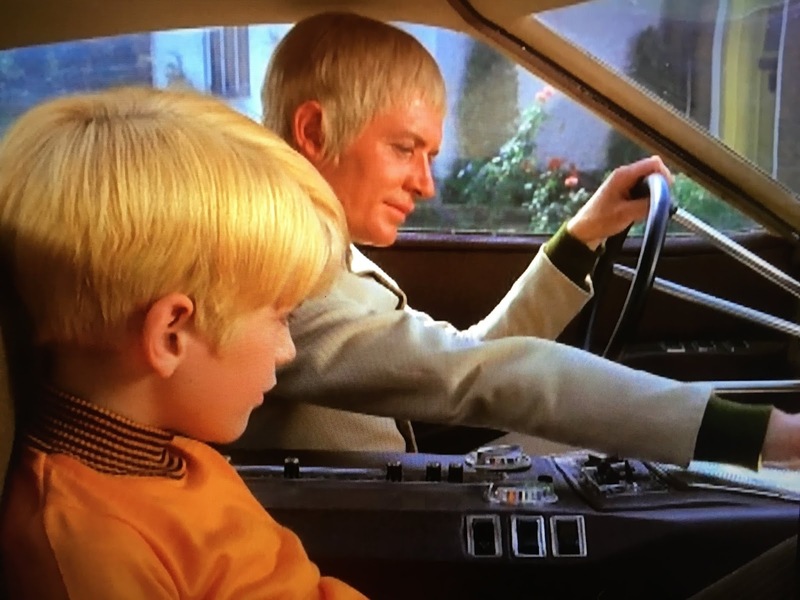 This episode offers a haunting, devastating portrait of Ed Straker, and it remains an unforgettable picture. Today, viewers are accustomed to seeing such tragic heroes. But nearly fifty years ago, a character like Ed Straker was the exception to the rule. In this narrative, Straker (Ed Bishop) takes his son, Johnny (Barnaby Shaw), home after a day of fun at the movie studio. Straker catches the vibe that he is not welcome at the home of his ex-wife, Mary (Suzanne Neve), and her new husband, Rutland (Phil Madoc), and leaves. But Johnny wants to show him a model boat he recently finished building. 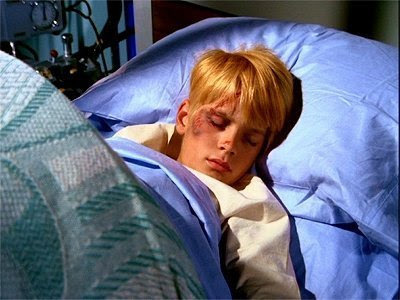 As Straker drives away, unaware that Johnny is still looking for him, the boy is struck down in the road by an oncoming car. Johnny is rushed to the hospital, but may not survive the accident because of severe internal bleeding. The boy is allergic to standard antibiotics, but there is a suitable one, untested and limited, available in America. Desperate to save his son, Straker arranges for a transport plane to pick up the drugs and fly them to Europe as soon as possible. At the same time, however, a UFO has crashed near the west coast of Ireland, and its pilot has set up a portable transmitter, suggesting he wants to be located by the humans. Alec Freeman (George Sewell), in charge of SHADO and unaware of Johnny's situation, re-routes the transporter carrying Johnny's medicine, to help in the efforts to triangulate the signal. He believes the alien may be a defector, especially because another UFO is en route to England. The alien is killed by the second UFO only moments before SHADO can reach him, and the medicine arrives too late to save Johnny's life. As the above-synopsis no doubt reveals, this is one dark episode of UFO. A later episode, "Confetti-Check A-OK" goes intro further detail about Straker and Mary's failed marriage, but that subplot is introduced here, in "A Question of Priorities." In this episode, Straker feels as though he is being squeezed out of his family. Mary has re-married. He only sees his son on weekends. And he is not welcome at Johnny's home. Straker is left, vainly, attempting to assert his parental rights. "He's still my son." When Johnny is injured, and Straker has the opportunity to more fully insert himself into Johnny's life, in the most meaningful way imaginable -- to save it -- he fails egregiously. All the while, Mary doesn't trust him, reminding him that "you always had to leave," when they are married. She also tells him not to "let Johnny down this time." Straker's failures as a family man are constantly thrown in his face. Of course, Straker is left with a "question of priorities" to weigh. Saving Johnny's life is important, but if a defecting alien is captured, how many more human lives might be saved? The tragedy here is not only that Straker loses his son, by getting him the medicine too late, but that it was all for nothing. 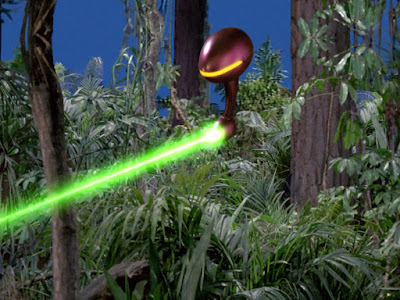 The defector is obliterated, and so SHADO gains no advantage against the aliens in this war. It's not like Johnny dies so that humanity lives. Johnny dies, and the status quo remains. Straker has gained nothing, and lost everything. Given all this, "A Question of Priorities" is not merely dark, it is brutal, in its treatment of the series protagonist. Straker is a broken man, one with no comfort and no family. He has sacrificed the love of his wife, and lie of his child, for the war against the aliens. The one episode of UFO the audience never sees, but which would have been amazing to witness, involves Straker after the war ends. We know, if counting UFO and Space:1999 as existing in one universe, that the aliens did not continue their war into the 1990's. Either they were defeated, or stopped coming to Earth, and died out. That would have let a sixty year old Straker, alone, with nothing left. No family. No life. No cause. What would he have been like? The series establishes that Straker smokes, but doesn't drink. One wonders how he would have coped with the aftermath of the war, and the realization that he no longer had a reason, essentially, to live. He didn't even have any vices to succumb to! The big question about "A Question of Priorities" is, for many of us, why Straker lets Alec use the transport, instead of rerouting it back to save his son. If it were me, I would have stood up and said "this war is not going to be won today. A little sick boy needs the medicine on that transport." No one: not Alec, nor anyone else, would have questioned Straker, or expected him to sacrifice my son. The boy could have been saved. Of course, once Straker made that he choice, he would have had to immediately resign from SHADO. He would have lost the faith, loyalty and support of those under his command. They would have known that their superior, their leader, was willing to put Earth second, and his own family first. If Straker set that example, how could he ever expect his people again to be selfless in the war? 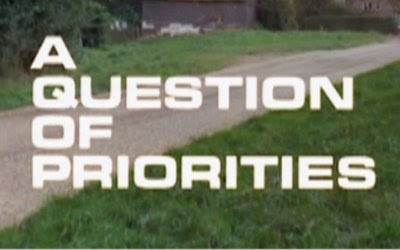 It is a close race for the best episode of UFO, but "A Question of Priorities" must rank near the top of the list. Near episode's end, the audience see Straker alone, in the hospital, from a high angle. His isolation is now complete, this camera angle reveals. In his dreams, in his nightmares, he will always hear Mary's ringing question: "what can be more important than your son's life?" Straker's curse is not that something else was more important than Johnny's life. It is that he can never tell Mary what that "thing" was; that he carries the responsibility for the whole human race on his shoulders. "A Question of Priorities" succeeds as well as it does because the episode, though contending with life and death, and family, is not histrionic. The episode offers a dispassionate, uncompromising view of a leader forced to make an impossible decision. Straker is stoic throughout the crisis and this approach lets the audience imagine his pain and suffering, and see the discipline he maintains to keep it buried. We don't need a tearful, emotional outbreak to know exactly what Straker is going through. His crisis is all the more powerful, and emotional because of the emotionless way he handles it. Next week: "Reflections in the Water." John, I hope all is well in your life. UFO is one of my favorite series after my absolute favorite SPACE:1999. Your reviews of these UFO episodes are brilliant. Like your book EXPLORING SPACE:1999, which I own multiple copies of, UFO is well served by your thoughts.